Hello...yup I am still awake...but this is my last card...my eyelids are starting to droop. 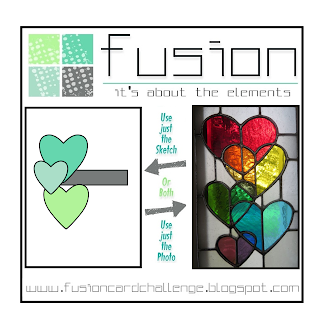 Fusion has a fabulous inspiration...I took a bit from both...those stained glass hearts are gorgeous and I love the simple sketch. I was inspired by the stainglass hearts, I wanted that glossy look on mine. I first colored paper with spectrum noir sparkle pens, then I glazed it with Nuvo Crystal Glaze. After it dried for an hour or so, I die cut the hearts added a sentiment and finished the card. They are quite shiny and have a subtle sparkle in person. I also loved the sketch, but I pulled my banner to the front instead of sliding it behind. Very pretty hearts! I agree with your putting the banner in front instead! wonderful card, Cat - bet it's really pretty IRL with the crystal glaze! Sweet card, Cat! Can't believe how productive you've been--I better get a move on or my Valentines will be late--yikes! Lovely CAS heart design! I bet the Nuvo glaze looks fabulous!